This year the Students of Young@Art will be donating their amazing artwork to raise money for Father Chris Riley's Youth Off The Streets. Original Artwork will be for sale from $10 with proceeds going to the charity. Lucy Boulton Smith will be signing her limited edition childrens books for sale with proceeds going to the charity. Refreshments, live music, fun art show bags for the kids, colouring in competition, and raffle to win original artwork will all be available on the day. Jenny Jackson from Hunter Valley Outreach, a spokesperson for Father Chris Riley's Youth Off The Streets will be speaking at 2:30pm. 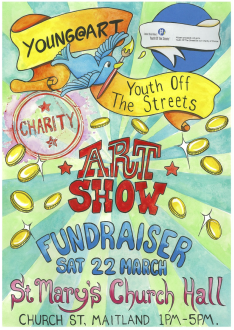 Please come and enjoy a relaxed afternoon of fun and creativity while our local young artists share their talent, while helping to keep our kids off the streets. 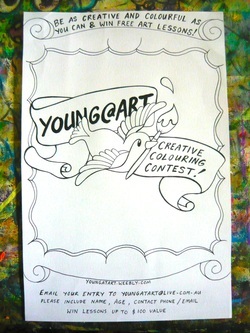 Collect a colouring contest from the art show and you will have the chance to win free art classes up to the value of $100! Be as creative as possible, fill in all the background with your own amazing artwork, show me what you've got and I'll reward you with free lessons! Winners will be chosen under the categories of super creativity, awesome colour, fine colouring and shading technique and an overwhelming passion for art. Anyone can win! I cant wait to see what you send me. Please remember to include in your email, your name, age, contact phone/email address. entries close on April 20 2014. Winning entries must use their credited classes during term 2 2014. Winners will be announced between April 21-28 2014. 2012 is going to be our most exciting year yet! This year marks the 10 year anniversary of our Art Classes and to celebrate we will be showcasing our talents in the fabulous YOUNG@ART STUDENT'S ART SHOW! So excited I just can't wait! 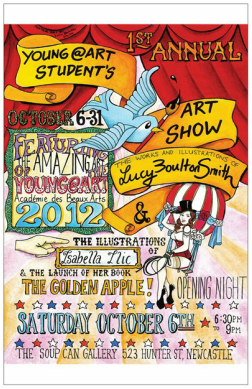 I am "Souper" excited to announce the very first YOUNG@ART STUDENT'S EXHIBITION, at The Soup Can Gallery, 523 Hunter Street Newcastle during the whole month of October 2012! Featuring our very youngest student Xavier Angel, only 2 years old and the launch of Isabella Ilic's fantastic children's book "The Golden Apple" on opening night. Books will be available for sale and signing on the night. Exhibition runs through to October 31. We had so much fun with the school workshops in 2011, so it seems only fitting that this year we will also be hosting plenty of Art Workshops at local schools which will be super duper fun! March thru to May at St John the Baptist Primary School, and May thru to July at Our Lady of Lourdes Primary! Our very own Isabella Ilic will be publishing her long awaited children's book "The Golden Apple" this year, and to celebrate this huge achievement her work will be a feature part of our Student Exhibition.